“It is interesting to note that as years go by the wants of the inhabitants of even the most distant parts of the world are steadily increasing, and while the older generations were satisfied with comparatively little in the way of luxuries, the rising generation look upon many of these luxuries as necessities. 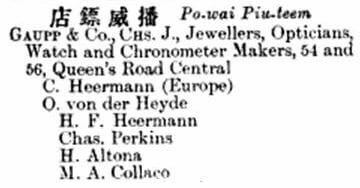 Perhaps one of the best examples in this respect is the demand for jewellery, and in Hong Kong this trade has very able representatives in Messrs. Chs. 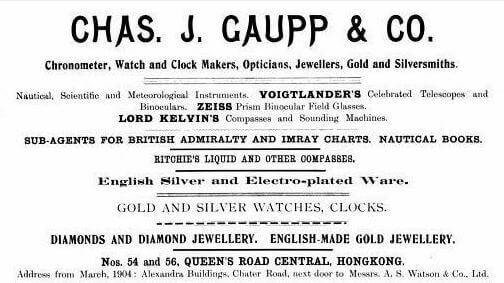 J. Gaupp and Co.
Their establishment is one of the finest of its kind in the East, and its large plate-glass windows display an artistic assortment of the many precious and useful articles in which the firm deal. To attempt a description of the beautiful stock within the shop itself would be idle, not to say Quixotic, in a necessarily brief commercial review. We can only say that from the nature of its rich and varied contents, the handsome character of the internal appointments, and the system that obtains in the arrangement of the goods, the establishment is characterised by all those up-to-date features associated with large contemporary houses in Europe. Here may be found everything that comes within the scope of the watchmaker, jeweller, goldsmith, silversmith, and optician. 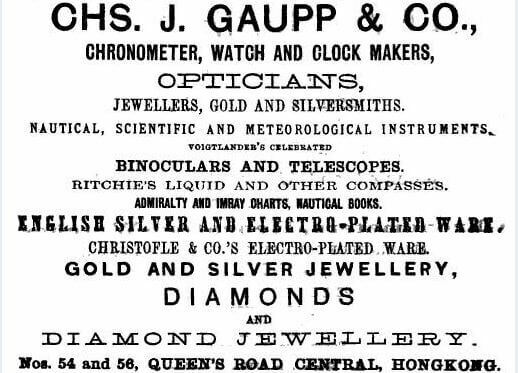 Every article supplied, whether it be in watches or clocks, in gems, in the precious metals made up into various forms, or in electro-plated ware fashioned with equal cunning and skill, is fully guaranteed as to quality. The firm do not compete in the matter of prices with houses dealing in goods of an inferior character, but they are fully prepared to enter the lists with any firm in the Orient dealing in precisely the same class of articles, and are in a position to offer to their patrons advantages which they will find impossible to improve locally. This article was first posted on 8th March 2017. Louis (Ludwig) Heerman, watchmaker, Queen’s Road, 1858-?